And that’s a big factor in the company’s success — passengers love the convenience of hailing a ride on their mobile phones and never having to open their wallets or calculate a gratuity. The company also said 1.75 million people have taken 28 million trips in Boston in its four years in the city. He has some company among Uber drivers, who number 360,000 across the country and more than 10,000 in the Boston area. 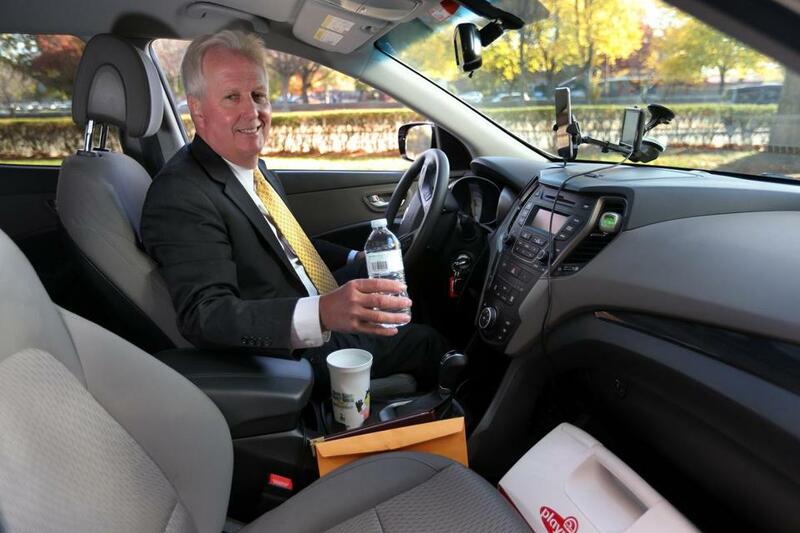 Part-time Uber driver Mark Bisson London keeps iced water in a cooler for passengers. “Maybe about 12 have actually offered a tip,” he said. 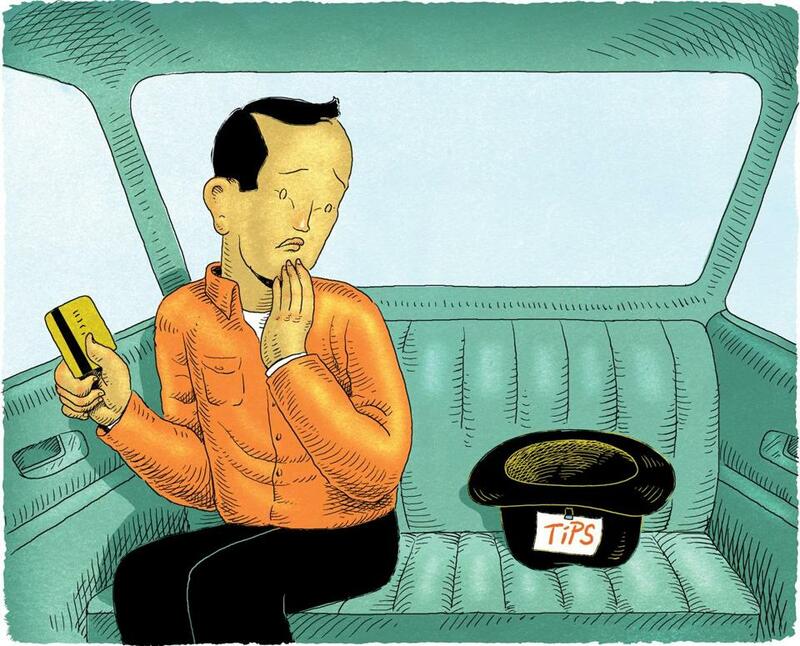 In interviews, several Uber drivers said tips were rare — proffered by anywhere from less than 1 percent to 5 percent of their riders. Their counterparts at Lyft, whose app allows passengers to add an electronic tip, said they received tips 20 percent to 50 percent of the time. A decision earlier this month by New York restaurateur Danny Meyer to raise prices and eliminate tipping at his restaurants has sparked a larger debate on tipping, which is deeply ingrained in service jobs such as waitressing and taxi driving. Some Boston restaurants are making similar moves, paying employees more than the tipped minimum wage of $3 an hour and eliminating tips. Many passengers take Uber’s guidance at face value. 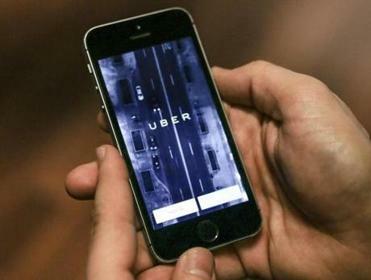 But there is some confusion, with others saying they had been told by friends or seen marketing from the company that “the tip is included.” Past claims by Uber that tips are included in the fare are the subject of two class-action lawsuits filed by Boston attorney Shannon Liss-Riordan. Some passengers say their rules vary. At peak demand periods, Uber raises its rates to entice more drivers onto the road, a practice known as surge pricing. Meanwhile, taxi drivers and their managers interviewed said they still expected and tended to receive 15 percent tips on their fares. The problem for most of them is that the fares themselves are drying up as people who used to take cabs shift to ride-hailing. In the first half of 2015, Boston taxi revenue fell 25 percent from the year before, city data show. Part of the discontent could be due to the hundreds of taxi drivers who have started driving for Uber, only to find they miss their tips. For the record: Uber says it isn’t a violation of its rules for drivers to accept tips, even if that means putting out a cup and a sign, which have been spotted in Boston. Vlad Christoff, the chief operations officers of the Boston ride-hailing startup Fasten Inc., said his company also doesn’t offer a tipping option because passengers feel pressured and don’t know whether drivers will rate them poorly based on whether they tip. Lyft, whose share of the ride-hailing market is estimated to be much smaller than Uber’s, has used tips and other perks as a recruiting tool to try to grow its driver base. A spokeswoman for the company said it has paid out $40 million in tips to its 100,000 drivers in its three years in business. That’s doesn’t seem to faze Mark Bisson London, a part-time Uber driver who has a perfect five-star rating from his customers. Despite that, he’s hardly seen a tip. Correction: Mark Bisson London’s record as an Uber driver was misstated in an earlier version of the story. He has a perfect five-star rating from his customers. Also, the photo caption incorrectly described the cup in London’s console.